Tensions had been bubbling under the surface. Even as Jose Mourinho’s Real Madrid romped to a record-breaking 100 points in La Liga last season to claim the title and end Barcelona’s domestic dominance, criticism of the coach remained. Now it can be seen and heard on a daily basis. Mourinho’s Madrid began 2012 with a healthy lead in La Liga but a disappointing defeat at home to Barca in the Copa del Rey brought boos from the home fans at the Santiago Bernabeu in the following game against Athletic Bilbao and a harsh assessment from the press. In the light of that 2-1 loss, Marca revealed a bust-up behind the scenes as Sergio Ramos and Iker Casillas argued with Mourinho in training over the defending of a set piece. The Portuguese blamed Ramos for a goal scored by Carles Puyol at a corner. The defender, in turn, claimed he and Pepe had changed marking duties because Barca had been using basketball-style screens to block some of the Madrid players at dead-ball deliveries. “You have never been a player so you wouldn’t understand,” Ramos told his coach, while Casillas complained of his coach’s assessment as well. Madrid drew the second leg against Barca in the Copa del Rey and markedly improved in that match at Camp Nou, while the capital club went on to secure La Liga in some style last season. But sections of the Madrid media remained against Mourinho and his prickly press relationship persisted as the current campaign got underway. So too did the problems with Ramos and Casillas. The defender stood up to his coach in the dressing room after Madrid lost at Sevilla on September 15 and found himself on the bench as Mourinho’s men came from behind to beat Manchester City 3-2 in the Champions League three days later. Provocative even in victory, Mourinho then upset both the media and his own club by criticising the cantera and Real Madrid B coach Alberto Toril in October, by claiming that Castilla looked after their own interests in Segunda instead of forming footballers for the first team. He also claimed many of the B-team were either too old or simply not good enough. It may well be true, yet the comments irked both the press and the club. Ramos, meanwhile, defied his coach in the 5-1 win over Deportivo La Coruna by turning out in the second half of the league match with the shirt of substituted team-mate Mesut Ozil underneath his own in a show of support for the German. Mourinho gave little importance to the gesture, at least publicly, but blamed his players after they were beaten by Betis in November, also hitting out at the referees and a supposedly unfair calendar which had seen his side receive less rest than Barcelona after Champions League action in midweek. 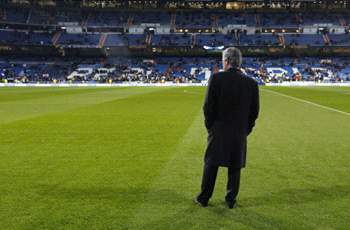 Then, last week, a row with Radio Marca‘s Anton Meana emerged as the journalist was taken aside and given a dressing down by Mourinho after his sources and information were questioned by the Portuguese. The 49-year-old denied a story claiming Madrid’s goalkeeping coach Silvino Louro, who was present, was something of a ‘spy’ for the former Chelsea and Inter boss, told Meana he was a “s**t” journalist and a nobody compared to Madrid’s “top coaching team” and claimed “two or three players” were leaking information from the dressing room. The entire story was then published the following day in Marca, a paper which had called for Mourinho’s signing after a trophyless season under Manuel Pellegrini in 2009-10. But on Sunday, after Mou’s Madrid lost out to Pellegrini’s Malaga (a side the Portuguese once claimed he would never coach) and Casillas was left on the bench, Marca‘s front page called Mourinho “ridiculous” and the paper also ran a survey on their site asking if the club should axe their coach after the events of Saturday night. More than 80 per cent said yes. Mourinho was backed publicly by president Florentino Perez just days ago but his fresh claims that “La Liga is almost impossible” will not have gone down well with the construction magnate. Nor will his isolation of Casillas. Jose Antonio Camacho soon left Madrid in 2004 after leaving David Beckham and Raul on the bench at Espanyol, while Bernd Schuster was removed in 2008 (prior to the return of Perez in 2009) for claiming it was “impossible” to beat Barcelona at Camp Nou. Mourinho could very well be next.